Well-developed logistic network guarantees the fast and accurate delivery of products. 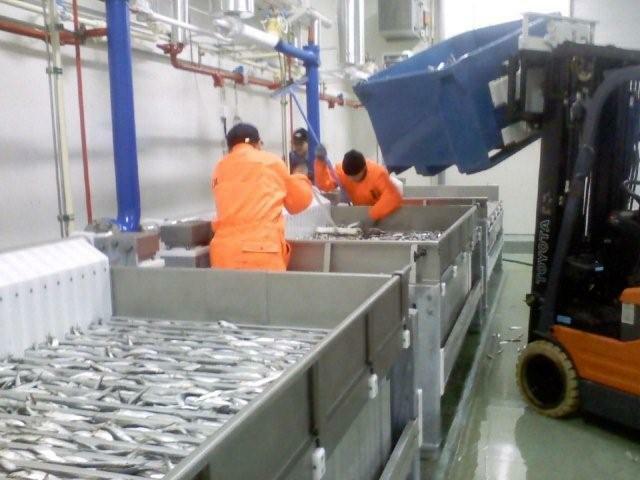 On the photo: Storage of fishery products in Finland. All our production facilities in Estonia and Finland have recognition numbers, necessary for international sale in European countries, and veterinary certificates for selling the products in Russia and Ukraine. All production buildings correspond to the highest modern standards. Contemporary buildings and processing equipment enable to give products with stable quality. We have developed control procedures in our production bases which follow the international HACCP (Hazard Analysis and Critical Control Points). Some people in our staff have been operating in fishery field since 1994 and ever since then they have made many efforts in order to introduce more contemporary production solutions. Contemporary and technically well-equipped production facilities guarantee stable quality of the products. On the photo: Fish factory in Uusikaupunki. Thorough and well-documented control process gives us a good overview of all the stages of product processing and transportation. Thanks to effective quality control we can offer our clients the products with stable and high quality. In order to deliver the goods to the clients in time, it is important to organize custom documents and other forwarding formalities quickly and precisely. Long term experiences in international logistics help us to deliver the goods exactly to the right place at the right time. Fishery products from the Gulfs of Finland, Riga and Bothnia. Trout and salmon products.